The 33rd annual Muslim Day today attracted Muslims of every age. Photo by Teddy Haines. A crowd of hundreds gathered in Midtown with floats, rhythmic chanting, and the flags of over a dozen countries to celebrate the 33rd annual Muslim Day Parade this afternoon. Muslims say this yearly tradition is a way for them to come together and speak with one voice, to assert themselves in an often inhospitable political climate, and to relay their message to a wider audience. For Mohammad Malik of Staten Island, this year’s march was his first, and he welcomed the opportunity to stand in solidarity with his community. Malik, a 38-year resident of the United States, extolled his “awesome” experiences in this country, as well as his belief that the world belongs to every human being equally. Before the procession began in earnest, there was a prayer session. The participants clustered on a long stretch of blue tarp to pay their respects. After that, the assemblage proceeded south down Madison Avenue from 38th Street. The long tradition of the parade in the city has shaped the upbringing of many of New York’s younger residents. Farwah Tahir, a young woman from Long Island, has participated in the marches for a decade, ever since her childhood. For her, the parade is a fixture that brings New York Muslims together to enjoy themselves. For the organizers of the Muslim Day Parade, the event forms one part of a larger strategy to enhance their community’s political engagement. A survey from the Public Religion Research Institute shows that 255,000 Muslims live in New York, around 3 percent of the city’s total population. Properly mobilized, this constituency could prove effective in the political arena, they said. The organization website credits this kind of participation for the 2015 decision to recognize two Muslim holidays in public schools. To build on such successes, the organizers also touted the parade as an opportunity to help attendees register to vote and to learn more about civic responsibility. The mood at this year’s parade was resolute and optimistic. Tahir Mian of Long Island has attended every year going back to 1985, and to him, there is no question that the community’s message is steadily winning through. He admitted that the parade “has its ups and downs,” but he expected a strong turnout this year. 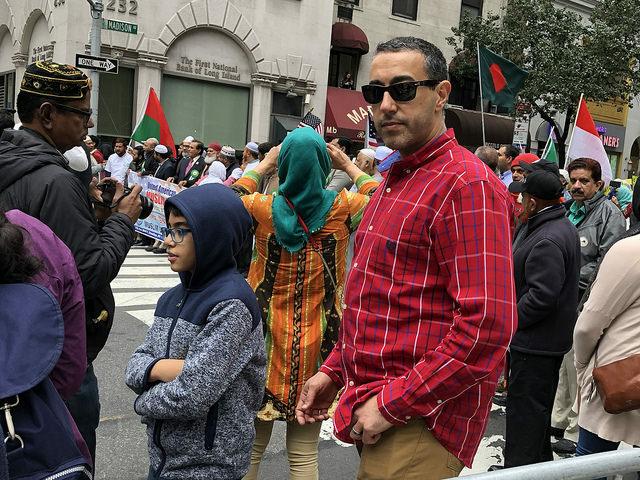 Mian stressed the point that as much as the parade offers an opportunity for New York Muslims to meet and engage with each other, it also provides them greater exposure in the city as a whole. More than anything, the progress on this front made him hopeful for the future.